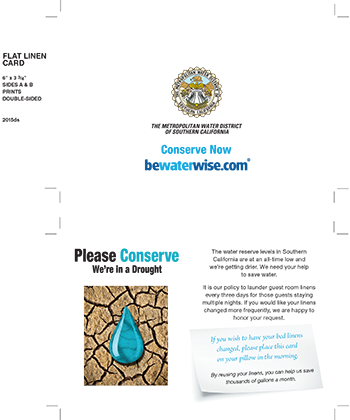 On June 1, 2015, Governor Jerry Brown passed legislation that requires restaurants to only serve water upon request. The new legislation also requires that hotels and motels give guests the option not to have their towels and bed linens laundered daily. A notice regarding this option must be prominently displayed in guest rooms. 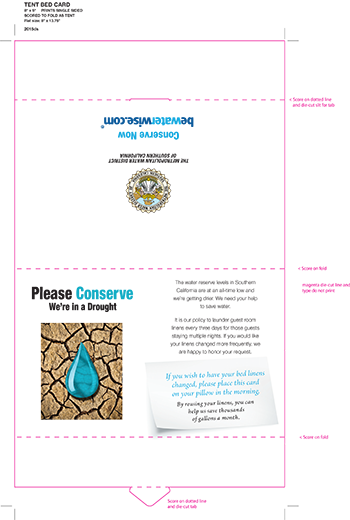 Although this expires on November 25, 2017, there is currently legislation in process to keep these requirements in place. 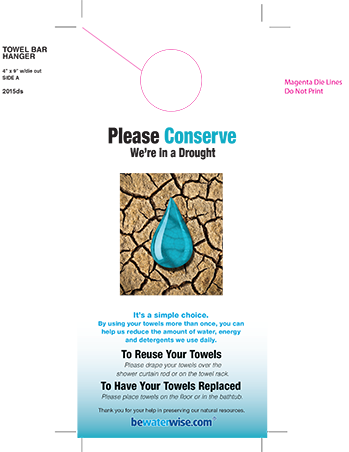 To help local restaurants and hotels meet these new requirements, the Municipal Water District of Orange County and local water agencies are offering free water conservation restaurant table-stands and towel/ linen reuse placards. To request these free materials, please complete our online order form and we will ship these materials to you at no cost.